If you need a bigger, better four-post lift that can handle a 27,000-lb., Class 7 semi-truck, you need the HDS-27. Bigger sheaves and beefier components carry on our legacy of dependability. If your shop services commercial and/or municipal vehicles, this lift is practically mandatory. 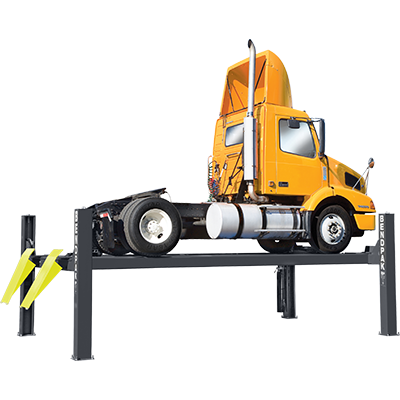 Every BendPak four-post lift, regardless of lift capacity, is made to exacting standards and gets the job done without undue strain or pain on the equipment. When we rate a truck lift at 27,000 lbs., that means anything at or under that weight limit is a cinch for our lifts to handle. We superbly over-engineer everything, so you can keep the “biggest and baddest” commercial and municipal vehicles up to code and ready for the next great haul. We take the time, cost and effort to bring you the best. Each sheave contained within the runway and cross tubes is a massive 12” in diameter, and the sheave axles, at 4” in diameter, greatly extend the lifespan of your lift by reducing the overall wear put on these parts. Manufacturing sheave components are even bigger than ones offered by our competition, which ensures superior quality in our product. Additionally, BendPak parts always meet or exceed ALI standards for load bearing and safety. Each of the four, 1/2” diameter, 6 x 25 galvanized lifting cables has a 14,000-lb. breaking strength, so a four-post lift as massive as this has the engineering to keep your vehicles safe at all times, especially during periods of heavy use. They won’t rust out or break apart due to bad weather, chemicals or random, floating garage particulate. Substantial 12" x 12" base plates support the massive columns. Some vehicles at the 27,000-lb. lift capacity begin to develop monstrous proportions. Garage trucks, for instance, are wide, tall and feature wide wheel bases. You need a car lift that can handle all those dimensions, plus the weight, without crapping out on you. The super-long HDS-27X may be the better option for your shop. Just be sure to discuss your service needs with a trained BendPak service representative if you need help deciding which 27K four-post lift is right for you.